I love it. I use it every other morning (as in…mornings I don’t go to the gym) in breakfast fruit parfaits or over hot cereal. I love it. And, thankfully, I have found some better choices when it comes to the sugars that are included. And I love finding granola I haven’t tried yet. And Udi’s Gluten Free released quite a few new options recently. 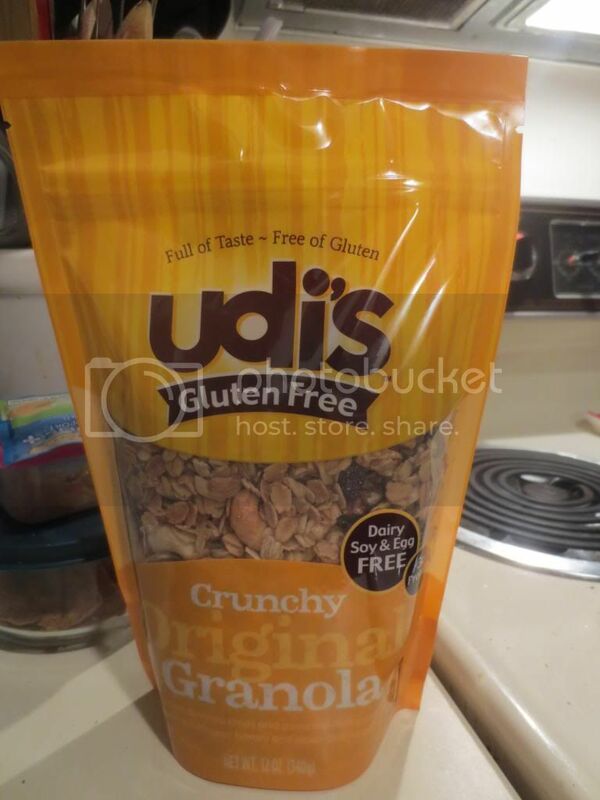 Now Udi’s Gluten Free has had granola out on the market for awhile…but the new varieties bring some extra oomph to the mix. For real. The variety that I purchased was the Udi’s Gluten Free Crunchy Original Granola. So…what is it? Simple. It’s a blend of oats that have been toasted and mixed with sweet and salty toppings. What might these be? Raisins, banana chips, walnuts, cashews, almonds, and pistachios. Mmmm…delicious! I love that blend. The raisins and the banana chips bring nice variety in texture, soft and crunchy…and also the sweetness that meshes with the honey toasted oats. The blend of nuts also adds variety as each has a distinct flavor and texture. And it just works! It works well. The oats are that right level of granola perfect. Kind of soft, but still crunchy. The raisins are plump and sweet. The nuts are amazing…because I love nuts. And the banana chips are a nice addition of sweetness that is a little unexpected but very welcome. The variety of ingredients and flavors really works well over the palate. It’s a fantastic play on the tongue. And I put this over some gluten-free hot cereal and it was really delicious. I mean…YUM! Ingredients are basically already listed above…with a few additions. Udi’s Gluten Free Crunchy Original Oats are made from certified gluten-free oats, wildflower honey, canola oil, raisins, banana chips, walnuts, cashews, almonds, pistachio nuts. I love, love, love it. Clean eating…right here! As for nutrition…this isn’t bad either. A serving size is 1/4 cup of granola. This is actually a rather large amount believe it or not. This serving will provide you with 140 calories and 6 grams of fat (of which, much is the healthy variety from the nuts). This granola is cholesterol free and sodium free. A serving also provides 7 grams of sugar, which is amazing in a granola. This serving will also give you 2 grams of fiber and 3 grams of protein. No, for real. This is one of my favorite granola I have had to date. And trust me…I have eaten a lot of granola. Why I never purchased this before, I don’t know. But I’m sold. The different textures, tastes…it works. It works magic, whether you top something off with it or eat it straight from the bag. You won’t be disappointed either. 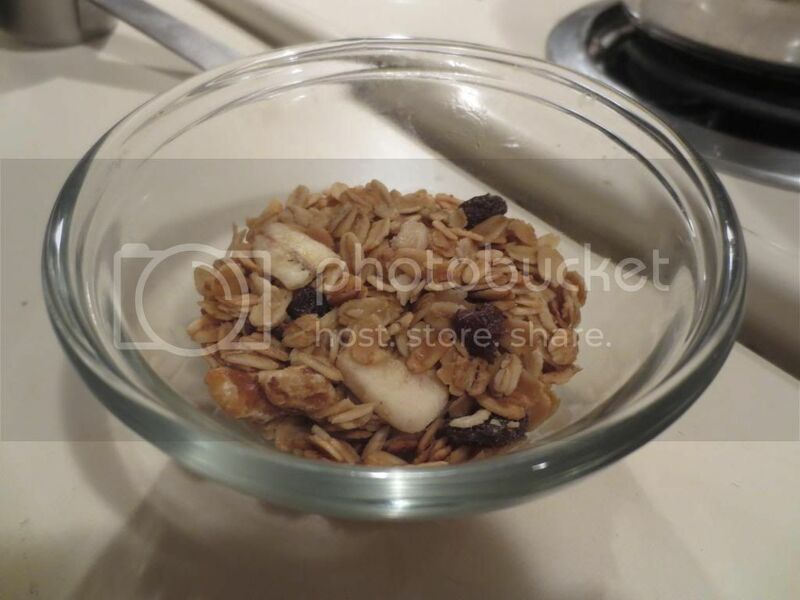 This entry was posted in Breakfast, Cereal, Clean Eating, Food, Fruit, Gluten-Free, Granola, Nuts, Products, Review, Snacks, Sweet Stuff, Vegetarian by The Celiathlete. Bookmark the permalink.